With organizations handling large amounts of data on a regular basis, MySQL has become a popular solution to handle this structured Big Data. In this book, you will see how DBAs can use MySQL 8 to handle billions of records, and load and retrieve data with performance comparable or superior to commercial DB solutions with higher costs. Many organizations today depend on MySQL for their websites and a Big Data solution for their data archiving, storage, and analysis needs. However, integrating them can be challenging. This book will show you how to implement a successful Big Data strategy with Apache Hadoop and MySQL 8. It will cover real-time use case scenario to explain integration and achieve Big Data solutions using technologies such as Apache Hadoop, Apache Sqoop, and MySQL Applier. Also, the book includes case studies on Apache Sqoop and real-time event processing. 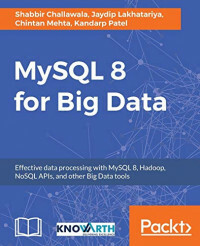 By the end of this book, you will know how to efficiently use MySQL 8 to manage data for your Big Data applications. Step by Step guide filled with real-world practical examples.